Fires affect thousands of facilities each year resulting in injury and building damage. Fire is a serious threat to the safety and security of any building. The primary goal of fire safety efforts should be to prevent loss of life and property damage by installing & maintaining reliable fire safety equipment. The products mentioned below present information on various types of fire safety equipment that can be used inside buildings for fire protection and preventing damages due to fire. Fire safety arrangements have become the basic necessity for residential buildings, offices, schools, multi-storey buildings, shopping malls, stadiums etc. Installing fire alarms and proper evacuation signage is just the first step of minimizing fire damage. Buildings need to be installedwith fire extinguishers, fire sprinkler systems, fog nozzles, hydrants, firewater storage tank and other fire protection products to help surpass fire hazards. Investing in fire safety equipment installation and regular maintenance is an easy way to prevent building fires. 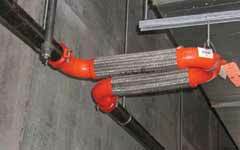 Check out our products list to understand how these fire protection products work.